Resilience of reef sites is analyzed to determine how resilient each of the sites are relative to other sites in the area. Managers may want to analyze relative resilience to compare resilience among sites considered for protection or to monitor changes in resilience over time. The ‘relative resilience score’ can be calculated to give us this information. If the maximum bleaching resistance value is 64%, a site with 64% receives a 1 (because 64 divided by 64 is 1) and a site with 60% receives a 0.94 (or 60 divided by 64). To calculate a ‘relative resilience score’ for each site, average values need to be determined for each of the resilience indicators used in the assessment. Since resilience indicators are assessed using different scales the values for all indicators must be converted into a standard scale using a process called normalizing. To normalize the data the values for each indicator are divided by the maximum value for the indicator. Then the scores for the indicators are averaged to produce the resilience score, which we also normalize by dividing by the maximum average score. The end result is a score for each site that is on a standard 0-1 scale, and the value for the site is a decimal value that is a percentage of 1. For most of the resilience indicators (e.g., resistant coral species, coral diversity, herbivore biomass), a high value indicates greater resilience potential. However, a high value for some of the resilience indicators actually indicates reduced resilience potential (e.g., presence of macroalgae and coral disease). We want to ensure that our scale is uni-directional and that a high score always means increased resilience potential (what we are aiming for from a management perspective). To address this, before we average all of the scores to produce a relative resilience score, the scores for macroalgae and coral disease (if included in the assessment) are subtracted from 1. Scores for all indicators are then averaged to produce the resilience score and then these scores are again divided by the maximum value to produce a final resilience score. The final resilience score expresses the ‘assessed resilience’ as relative to the maximum resilience for the sites included in the analysis, and high scores mean high resilience potential. It is important to note that there is currently no published and defensible weighting scheme for resilience indicators that apply to reef areas globally, so all indicators should be equally weighted in the analysis. The approach described above can also be used for the indicators related to anthropogenic stress. Resilience indicators related to anthropogenic stress (e.g., nutrient pollution, sedimentation, physical human impacts, fishing pressure) are separated from the other key ecological indicators because they can be directly addressed through management actions. The values for all sites for each anthropogenic stressor are divided by the maximum value and then the values are averaged and again divided by the maximum value to produce a final stress score. For anthropogenic stress indicators, high scores mean high stress. For both resilience and anthropogenic stress, a high, medium and low range of scores can be developed. Resilience assessments, conducted in Micronesia and the Caribbean, used the following data ranges for final resilience scores: 0.8-1.0 for high, 0.6-0.79 for medium and <0.6 for low. Managers may also want to conduct additional analysis to determine whether differences in resilience scores are consistently driven by certain resilience indicators or suite of indicators. A Principle Components Analysis (PCA) is a statistical analysis that can be used to determine commonalities and differences among the scores for resilience indicators. It can also be used to determine which resilience indicators are the strongest drivers of differences in the resilience score. A PCA analysis can be useful because the resilience indicators that most greatly influence rankings should be a part of any ongoing monitoring, if they are not already. Assessing relative resilience is an area of active research; examples of resilience assessments are provided in the resource section below to guide the selection and implementation of resilience assessment methods. Additionally, a new tutorial (pdf) has been developed to help organize and analyze data on resilience indicators. There are several presentation formats that managers may find useful for sharing the results of the resilience assessment with partners and stakeholders. Sites can be ranked from highest to lowest resilience and these rankings can be presented within tables or spatially on maps that distinguish high, medium and low resilience sites using colors (e.g., green, yellow and red). 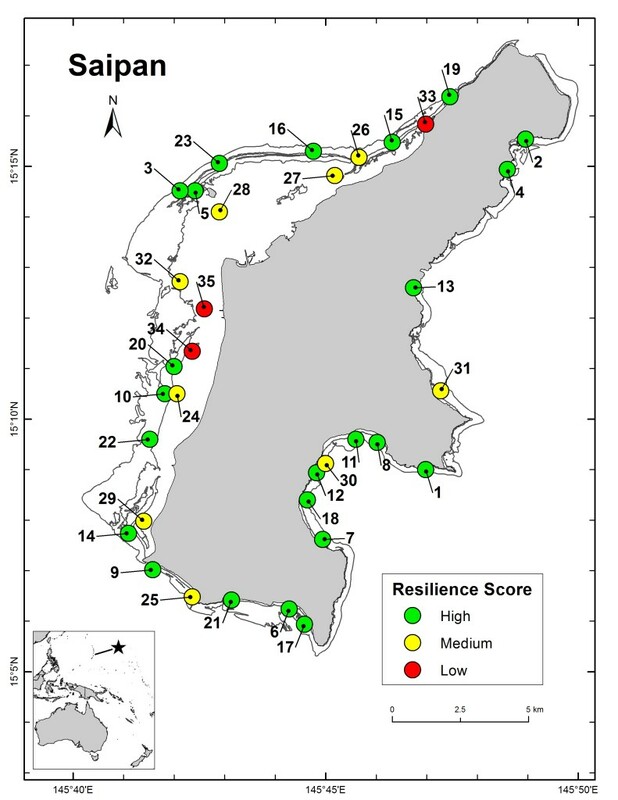 Example of resilience assessment map for coral reefs in Saipan, resilience scores classified as high (0.8-1.0), medium (0.6-0.79) and low (<0.6). Source: Maynard et al. 2012. The approaches described above (calculating ‘relative resilience score’ and PCA) require experience with spreadsheet formatting and editing in a program like Excel, a basic statistical software package, and mapping software like ArcGIS. There are number of recently developed tools to support managers in analyzing relative resilience – a guidance document, a tutorial for analyzing resilience assessment data and an accompanying excel file that walks users through the analysis. Guidance is also available to consider current and future exposure to climate-related and connectivity data in resilience assessments. Additional resources including examples of resilience assessments can be found in the Resources below.